Scene view Perspective view This is where you set the scene, selecting and positioning environments, the player, the camera, enemies, and all other GameObjects. Game view Camera view The rendered view from the camera(s) in your game. It is representative of the final, published game. 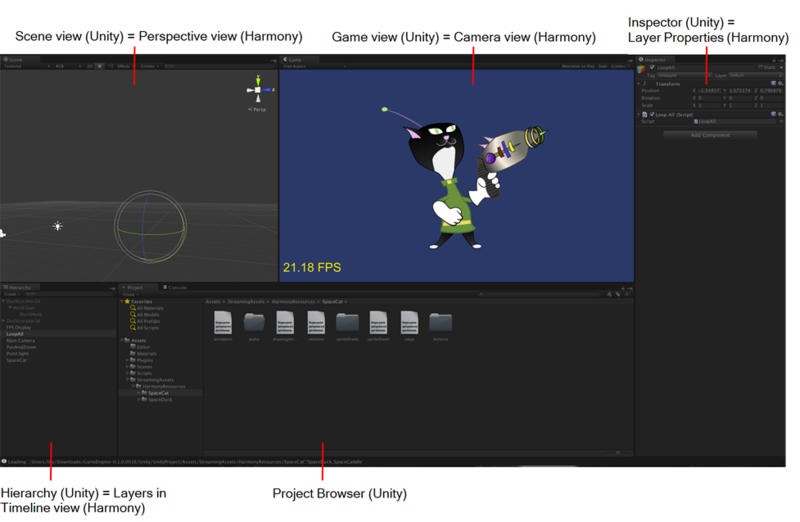 Inspector Layer Properties Displays detailed information about the selected GameObject, including all attached Components and their properties. Hierarchy Layers in Timeline view Displays the hierarchy of elements in the scene, and lets you set up parent-child relationships for different game objects. Project Browser --- Lets you access and manage a project's assets. The main camera displays the scene and is located in the Hierarchy. To show a Harmony object, you must add a special component. With the main camera selected, in the Inspector, select Add Component > Scripts > Harmony Camera.